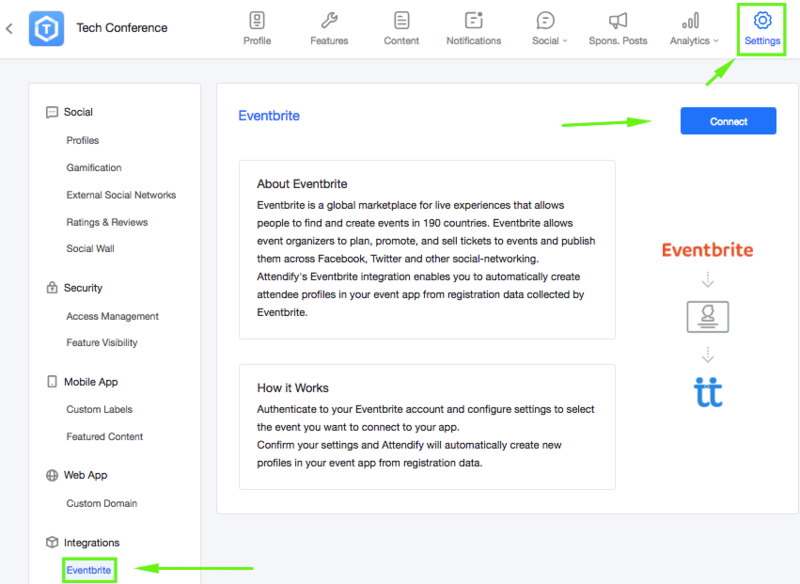 The first six integrations are used to help you automatically create attendee profiles in your event app from registration data you collected through one of the services. The integration with Salesforce enables you to automatically transfer attendee profiles outside the app to your Salesforce account and create new leads. These first three steps are not required to connect your Attendify Registration to your app/event. 1. Log into the management dashboard and enter the tab "Settings". 2. In the lower-left area of the screen go to Integrations section and pick the service you want to connect. 3. Check the section "How it works" for instructions and click the button "Connect" to enable the integration. 1. Go to the Social > Attendees (Profiles) section of your dashboard. 2. Click the button "+ Add"
3. 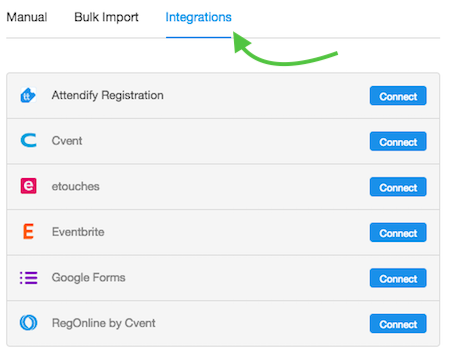 Go to the Integrations tab and click the Connect button next to the integration you'd like to connect. NOTE: In case you have a multi-event app, you should enable integrations at the container level (not at the level of a separate event). Here are the details on how to connect an integration to a multi-event app. After the integration has been enabled, each 30 minutes your app retrieves new attendees that have registered through the connected service. In case someone deletes his/her account/cancel their order on the integrated service, it will still stay in the app. Once the integration is activated, all newly created profiles are automatically transferred to your Salesforce account and added as leads, those profiles that had existed in your app before the integration was activated aren't transferred. Select the From Response 1 instead of Entire Document.